“Is today a good day to die?” This is a question that Finch is always asking himself. Finch is fascinated by death, and is always thinking of ways to end his life, but whenever something good happens no matter how small, he stops himself. Violet is one of those good things. Ever since the tragic accident that killed Violet’s sister Eleanor, Violet has lived for the future and she always plans ahead. By counting down the days until graduation, she is distracting herself. Due to a twist of fate, Finch and Violet both end up on the ledge of the bell tower at school, they never quite figure out who saves whom. 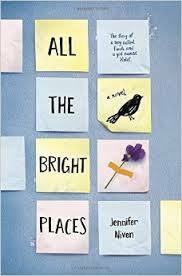 All The Bright Places by Jennifer Niven is an enthralling love story that follows two teens named Theodore Finch and Violet Markey. Finch and Violet are very different from each other. Violet is very popular, and is just trying to please everyone she meets. Finch on the other hand is known as the ‘‘Freak’’, and does not acknowledge how the things he does might hurt people around him. But when Finch requests to work on the final project of the year with Violet, to discover the “natural wonders” of Indiana, both Finch and Violet discover more about themselves and each other than they thought they would. Finch discovers that he can be himself when he is with her. Violet finds out that when she is with him she can enjoy the days she has not the ones that are yet to come. However as Violet is learning to be herself again, Finch is beginning to realize that his is world of protection is shrinking. All The Bright Places by Jennifer Niven is a captivating novel that draws the reader into the life of two very troubled teens. At the beginning of the novel it is a bit hard to follow what is going on or why the characters are in that particular place at that time. Due to Finches frequent change of character. However as the story continues on it draws the reader into the minds of Violet and Finch. Which I find is a very good aspect for a story to have. Although the story is fantastically written, I would not recommend it to young children due to some graphic content.